We didn't have a formal tour today, but were allowed to roam the exhibits at the National Library of Scotland at our leisure. 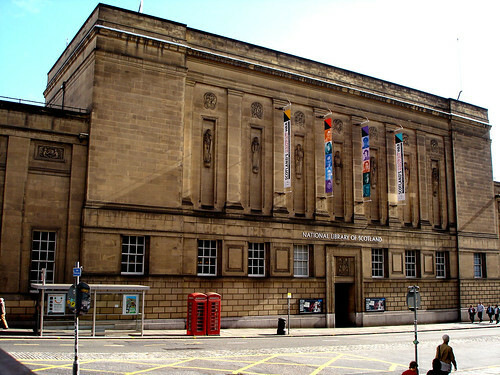 With roughly 14 million items, the National Library of Scotland (NLS) is Scotland's largest reference library, specializing in all things Scottish. The building we visited was opened in 1956, though the NLS itself was established in 1925. A library card is needed to use the reading rooms, so we didn't get to see those. However, the exhibitions they have were open to anyone, and many of the displays were interactive. I particularly liked the John Murray Archive exhibit. John Murray was a prominant publisher who published some of the most important figures of his day, such as Lord Byron, Jane Austen, and Charles Darwin. The displays on each figure had a touch screen where you could scroll through a brief history of that person, sometimes including more scandalous details of their lives. Another part of the exhibit contained a large table which had an interactive display projected onto it. This display let you choose what kind of book to publish, including the genre, the style, the target audience, and even what the cover would look like. At the end, it predicted what kind of sales your book would have (mine would have low sales, but a strong cult following).